A little over a week ago, Jim put together a post asking for reader suggestions about places we should visit, and the suggestions came in fast and furious. Well, maybe not exactly fast and furious, but we did get a few quality suggestions, including one that mentioned Upland's Teddy Bear Kisses Imperial Stout release at Goose the Market. We're certainly not strangers to Goose the Market. 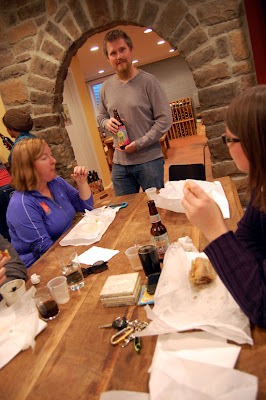 I filed a beer diary from their new(ish) Enoteca back in June, we had a beer and cheese benefit there in September, and Goose's Corrie is a regular contributor to our Random Beer Roundup. So although we know that it was none other than Corrie that suggested we stop by (sneaky! ), we couldn't resist the offer. Or the sandwiches. 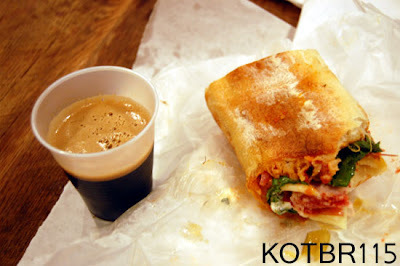 I have a once a week Batali habit anyway. (Nice story behind that Batali link). I've mentioned Teddy Bear Kisses before - different varieties have made their way past my lips in the year or so (1, 2). I'm a certainly a fan. The beer is a chocolate bomb, with a nose that says "brownies! ", a front that's somewhere between dark and milk chocolate (right in the sweet spot where you could drink/eat a ton of it), a creamy mouthfeel, and a slightly bitter finish. 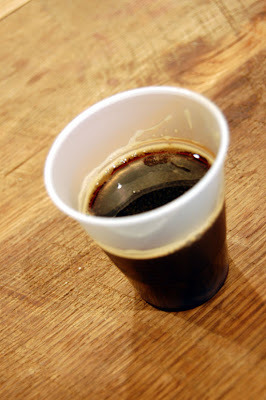 It's not a beer with a ton of complexity, really, but if I'm drinking liquid chocolate I really don't mind that at all. I bought two bottles. I haven't bought two bottles of anything (that didn't say New Glarus Belgian Red on them) in a really long time. 4.85 Mugs. There is a great nose on this one of sweet chocolate and roasted malt. This beer seems to hit my senses in all of the right places. The chocolaty aroma carries through to the flavor, helping to mask the high abv. Dark chocolate, cocoa, and elements that are roasty without being smoky are things I love in a beer and this one has all of them. 3.99 Mugs. This ominous looking stout is very dark with toffee brown edges. Pours syrupy and thick with just a little carbonation. The nose is pure dark chocolate with a hint of maple syrup. On first sip you get a dark chocolate flavor and a little burnt sugar. There's a warming alcohol kick on the finish with notes of licorice and maple. This is a dry chocolate imperial stout with more of a bakers chocolate flavor than other imperial stouts. 4.1 mugs. 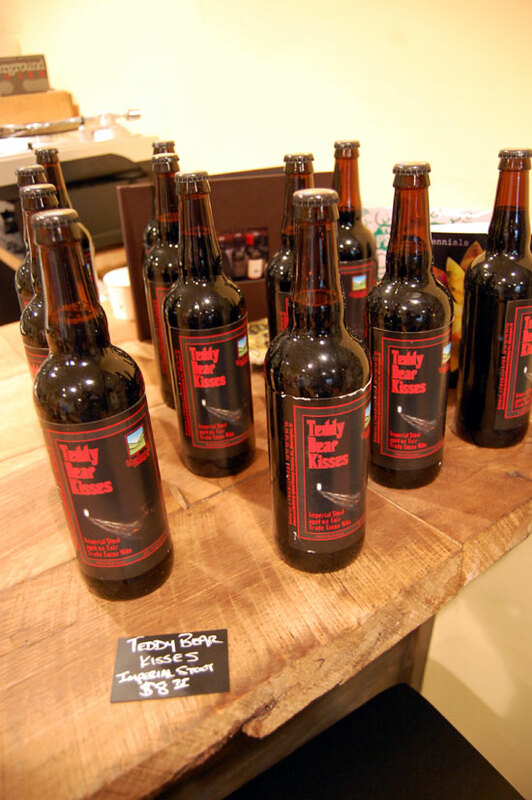 Thinking back, I think I only had barrel-aged varieties on Teddy Bear Kisses last year, so I really don't know if any of it was aged on cocoa nibs. Either way, this is one solid imperial stout with a hefty dose of chocolate. When approaching this beer, it smells like a typical imperial stout, dark and roasty with a twist of baker's chocolate. All of the imperial stout flavors are present, charred barley, licorice, toffee and dark chocolate, but the chocolate plays a much bigger role here. Teddy Bear Kisses is slightly sweeter than most of its Russian Imperial Stout counterparts, and the cocoa nibs definitely add a big burst of dry, roasted dark chocolate flavor. A bit of maple syrup complexity is hiding underneath the roasted character, but it is clearly the chocolate that is the standout in this beer. Everything seems to be in great balance and this is a solid interpretation of the style. I'll plan on buying a bottle of this each year it comes out. 4.2 mugs. I thought this was going to be a post about the 501. I thought I'd mention that this beer sold out in an hour and a half at Goose. We only had one case available at the time (more is on the way! ), but I thought it was a great reaction from the crowd. Thanks to the HBG crew for coming out plus some of our friends. It was a fun event, and I'm looking forward doing it again. I might have purposely went with that title to draw the attention of the 501 crowd - or the 501-crowd curious.